Hirshhorn Plaza: The plaza redesign, by landscape architect James Urban, includes granite surfaces, trees and other plantings, areas of lawn, an outdoor pathway, and ramp accessibility from the northwest end of the Ripley Garden. Throwback (1976-79) by Tony Smith. Brushstroke: This 32-foot-high by 20-foot-wide towering black-and-off-white painted aluminum sculpture reinforced with I-beams is one of the last examples of Roy Lichtenstein's (American, 1923-1997) ongoing engagement with the brushstroke motif. Based on a model created in 1996, it was enlarged and fabricated 2002-2003 by Amaral Custom Fabrications in Massachusetts under the supervision of the Lichtenstein estate. Sunken Sculpture Garden: Transformed by season, time of day, and even weather, the garden provides an ever-changing backdrop and contemplative haven for viewing over 60 large-scale works of art (wheelchair accessible). Horse and Rider by Marini. 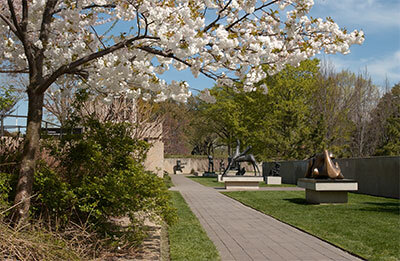 Other sculptors represented include de Kooning, Giacometti, Lipchitz, Manzu, Miro, Moore, Shea, and Smith. For Gordon Bunshaft 2007: This site-specific work by conceptual artist Dan Graham consists of a triangular pavilion with two-way mirrors (with glass doors to enter the structure) and an open wooden lattice that stands approximately 7.5-foot tall. Are Years What? (for Marianne Moore) 1967: Installed in the street level section adjacent to the sunken sculpture garden, this sculpture created by Mark di Suvero (b. 1933) is composed of industrial I-beams painted bright red and rises some 40 feet from the ground. The 10-ton work refers to a poem by the American poet Marianne Moore (1887-1972). Installed August 22, 1999. Wish Tree: Given by artist Yoko Ono to the museum on April 2, 2007, the Wish Tree, located in sculpture garden, is a white Japanese flowering dogwood tree. In the summer, visitors may write their wishes on paper and add them to the tree's branches.